The Global Times, a Chinese state newspaper, announced Thursday that the government would soon debut a new series of textbooks that would “place greater emphasis” on the mid-20th century war between China and Japan and give students “a strong sense” of China’s claims in the South China Sea. China claims nearly the entire South China Sea, including territory internationally recognized as part of Vietnam, Brunei, Taiwan, the Philippines, Malaysia, and the waters off of Indonesia. The Global Times also mentions the Senkaku Islands, known in China as the “Diaoyu,” a group of uninhabited but resource-rich Japanese islands that Beijing has claimed for years. The Global Times notes that the books will be used in history and “morality” classes throughout the nation, and “have more content regarding the War of Resistance Against Japanese Aggression.” That war is internationally recognized to have occurred between 1937-1945; China revised its textbooks in January to rename it the “14-year war of resistance against Japanese aggression” and declare its beginning in 1931. The article puts a specific focus on highlighting the brutality of the war with Japan. “Previous textbooks only set out major battles, but the new ones not only cover the history on the battlefield’s frontlines but also the behind-the-scenes battlefields. The books reflect the role of the Kuomintang, as well as underlining the role of the Communist Party of China (CPC) as the mainstay in the war,” Ye Xiaobing, a professor, is quoted as saying. 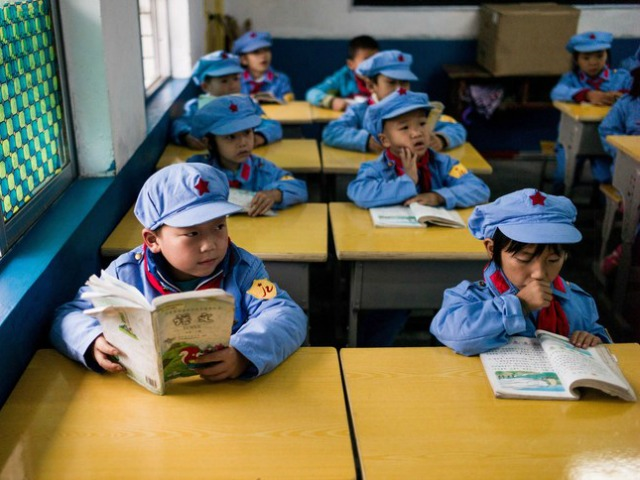 The books will also teach children more about the history of the Chinese Communist Party, though presumably skip the 45 million people killed by Mao Zedong’s Great Leap Forward and the 1.5 million killed during the Cultural Revolution. “The foundation of the CPC and the fact that the CPC led the socialist revolution and reform are covered in two of the history books, which examine the lives of more than 40 communist revolutionaries,” the Times claims. Xinjiang is the westernmost region of China, home to the nation’s Uighur Muslim minority and a separatist insurgency. Much like Tibet, any in Xinjiang resent the imposition of Communist rule, particularly as Beijing has expanded its religious limitations, from banning Islamic clothing on public transportation to forcing shops to sell alcohol and cigarettes, violating Islamic sharia law. Taiwan has also increasingly protested an increased Beijing presence in its politics, while the Diaoyu islands belong to Japan and an international tribunal has dismissed China’s claims in the South China Sea. Japan, too, however, has faced criticism for the presentation of its history in textbooks. Japanese curricula focuses very little time on World War II and the atrocities committed by Imperial Japan. Japan’s books also teach that Japan is the undisputed owner of the Senkaku islands, and promote as well the territorial claims disputed with South Korea.